Premium PowerPoint Map of US State Massachusetts. This detailed PowerPoint Map Template shows Massachusetts counties, county names and biggest cities including the Massachusetts state capital. Premium PowerPoint Map of US State Massachusetts. This detailed PowerPoint Map Template shows Massachusetts counties, county names and biggest cities including the Massachusetts state capital. The Massachusetts PowerPoint Map is hand drawn and fully editable in size and color. Specific territories can be highlighted easily with just 2 clicks in PowerPoint. 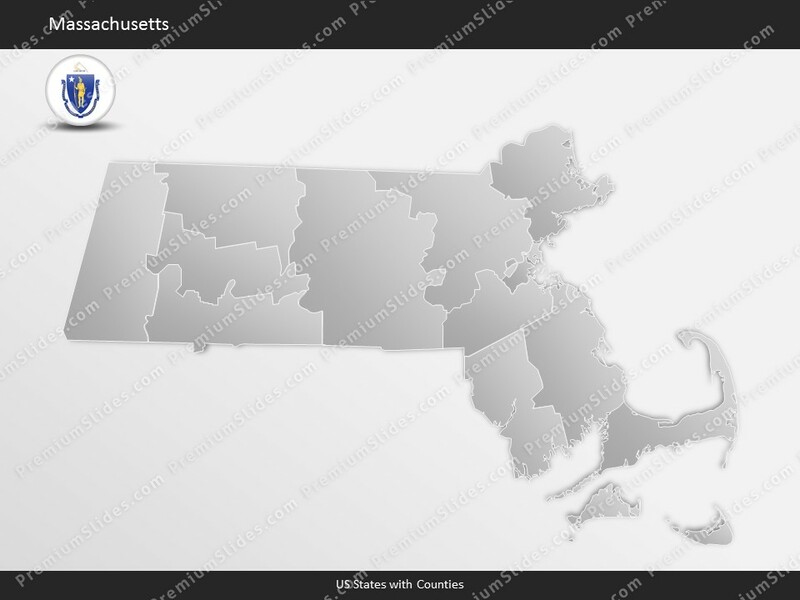 The Massachusetts Map Template is a great benefit for showing sales data in this state. Do not wait! 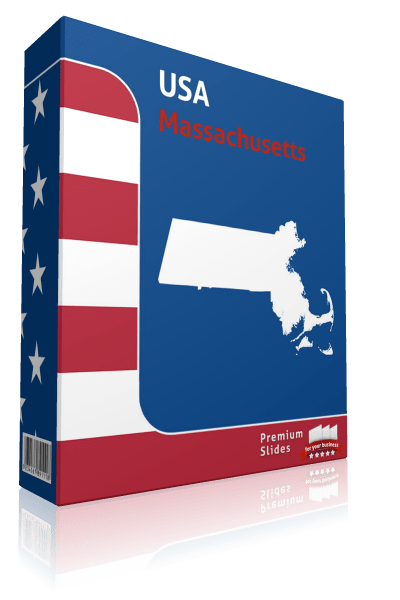 Get this Premium Massachusetts Map Template for an unbeatable price today and impress your audience in your next meeting! Facts and information about Massachusetts State you can use in your presentation. Massachusetts (MA) is also known as the Bay State; Old Colony State. The name Massachusetts comes from Massachusett tribe of Native Americans, meaning "at or about the great hill". The date of admission to the Union was on February 6, 1788 out of Crown Colony of Massachusetts Bay. It is the 6th state to joining the other constituent entities. The motto of the state is: Ense petit placidam sub libertate quietem (By the sword we seek peace, but peace only under liberty). The total size of this US State is about 10,554 square miles. Therefore Massachusetts ranks in 44th place among all other US States in terms of land area. Actually 7,801 square miles are covered by land and 2,754 square miles are covered by water. The mean elevation is 500 feet. Massachusetts's highest point is Mt. Greylock with a height of 3,487 feet. The lowest place is Atlantic Ocean, which is below sea level. Its geographic center can be found in the town of Rutland in Worcester County. Massachusetts is bordered by the following states: Connecticut, New Hampshire, New York, Rhode Island, Vermont. In 2015, 6,794,422 people lived in Massachusetts. The most people live in the capital Boston. The residents are called Bay Stater. Massachusetts is the birthplace of these presidents: John Adams was born on October 30, 1735 in Braintree (In office March 4, 1797 – March 4, 1801), John Quincy Adams was born on July 11, 1767 in Braintree (In office March 4, 1825 – March 4, 1829), John F. Kennedy was born on May 29, 1917 in Brookline (In office January 20, 1961 – November 22, 1963), George H. W. Bush was born on June 12, 1924 in Milton (In office January 20, 1989 – January 20, 1993). Massachusetts is known for these industries: Machinery, electric equipment, scientific instruments, printing and publishing, tourism. Massachusetts is significant producer of agricultural products, including Seafood, nursery stock, dairy products, cranberries, vegetables. Massachusetts belongs to the region of the Northeastern United States. The Census Bureau has designated four regions for the United States. Although there are other definitions, these four regions are generally used in classification systems and for data collection and research. These four regions have not changed since 1880, and is nowadays are commonly taken as a standard for data tabulation. The Northeast region consists of the following nine states: the New England states of Connecticut, Maine, Massachusetts, New Hampshire, Rhode Island, and Vermont; and the Mid-Atlantic states of New Jersey, New York, and Pennsylvania. The American Northeast has a total area of 181,324 square miles (469,630 km²) with a land coverage of 162,257 square miles (420,240 km²). The Northeastern region of the United States is the most economically developed, heavily populated, and culturally diversified region. Of the entire nation's 4 census regions, the Northeast is the second most urban, with 85 percent of its population residing within urban areas, led by the West with 90 percentage.